A recent analysis in a top business site has suggested that the Gujarat government has messed up data on the “successes” it claims to have achieved in the high-profile Vibrant Gujarat world business meets, with the state’s own data revealing that the summits have failed to generate jobs, which has been one of the proclaimed aims. However, the Gujarat government, says Nair, “forgot to remove the data from one place, the website of the Commissionerate of Industries, government of Gujarat”, whose figures show that from January 1, 1983 to September 30, 2016, a total of 6,251 projects were implemented in Gujarat with a cumulative investment of Rs 2.76 lakh crore, generating 10.67 lakh jobs. The official data further state that another 4,033 projects are under implementation with a total investment of Rs 951,980 crore, which is projected to generate another 9.30 lakh jobs. 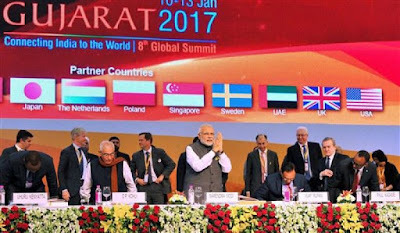 In all the eight editions of the Vibrant Gujarat summits, the Gujarat government has declared that it has signed 51,378 MoUs worth a whopping Rs 84 lakh crore. Ironically, says the analyst, India’s GDP “currently stands at nearly Rs 170 lakh crore, and the government claims that “57% of these signed MoUs are either implemented or under implementation”, wondering why it doesn’t find reflected in the country’s GDP. Checking on the type of MoUs signed by the Gujarat, in the road and railway tab, Nair says, he found (click HERE and HERE) a subsidiary of an infrastructure development group with a paid up and share capital of Rs 5 lakh each had signed an MoU. “One gentleman, requesting anonymity, said almost all the builders in Ahmedabad signed up MoUs, irrespective of the size of the company. And whether they sign up these MoUs or not, that is the business they are into since years”, he adds.